Customer relationship is key in the hotel industry. Some of a hotel's responsibility is to provide information for their customers including hotel details, conference information, dining information and local tourist areas to visit. Command's digital signage and wayfinding systems provide an efficient method of providing the right information to your hotels visitors. RoomManager is an easy-to-use conference and meeting room management and LCD display system. Say goodbye to the old letter boards and pieces of paper at the front of the room, RoomManager will display client information in your foyer or at the entry to the conference or meeting room all easily managed through one easy-to-use application. A user can enter client data and logos, room information such as the time of the event and the automated template system will generate the screen displays for you. Directional screens will get your visitors to the event in a timely manner. Wayfinding screens are used to provide turn-by-turn directional information for hotel locations or provide details of external visitor information. The flexible wayfinding software is easy to use for the visitor and for the administrator. Change and updates can be made at any time. The digital menu board is an ideal method of promoting your restaurant and displaying the menu to your visitors. 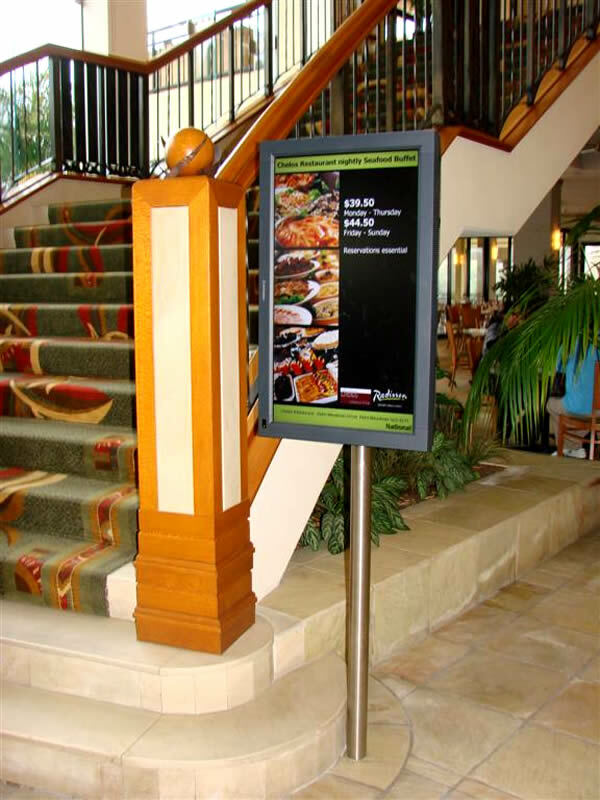 The menu boards can be located within your restaurants or outside for the passing traffic. Promoting other locations within your chain of hotels allows you to on-sell your business and promote further options for the traveller.